The designation Coronet Head sometimes is used to describe the large cents of 1816 to 1857 in general, but most often is applied to those struck from 1816-39. Coronet cents also are divided into subtypes, such as the Matron Head, coined as late as 1835; the Young Head of 1835-39; and finally, the so-called Silly Head and Booby Head subtypes, unique to 1839. 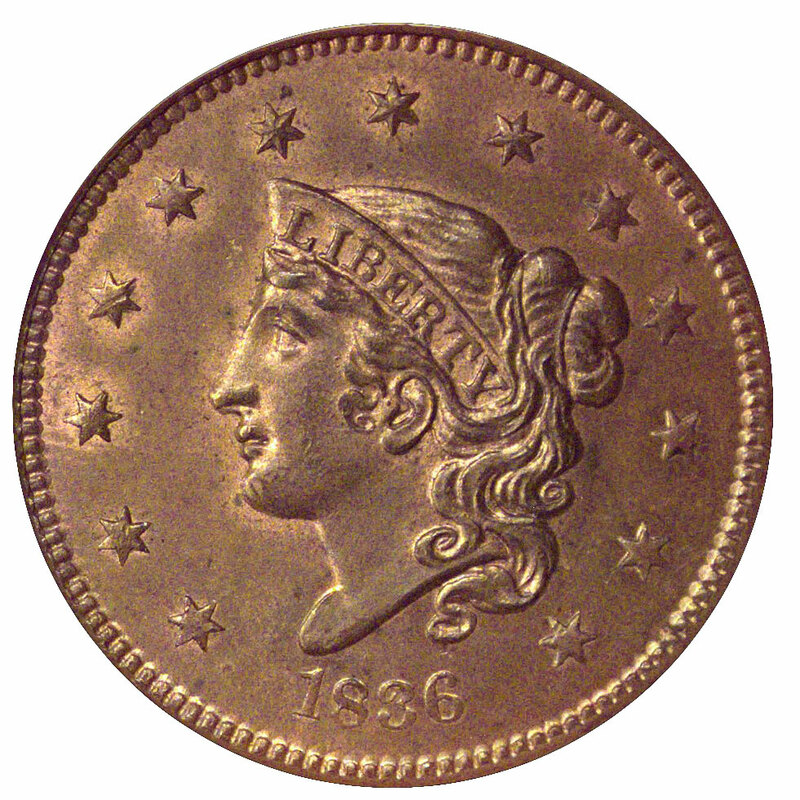 Curiously, The Official American Numismatic Association Grading Standards for United States Coins places the Young Head cents in the grading section with the Braided Hair subtype of 1839-57. I don't understand the reasoning behind this decision, but it coincides with the breakdown of subtypes in the "Red Book" (Whitman's A Guide Book of United States Coins). This seems to be more a matter of semantics than numismatics. The Coronet series spanned the era of the hand-powered screw press (up to 1836) and the steam-driven knuckle press. While the cents from the new presses were more fully struck as a rule, this does not affect their grading criteria to a great extent. In fact, grading circulated large cents of this period is a fairly straightforward process. For the most part the photographs and descriptions in the grading guide are quite clear and easy to use. Explanatory notes provided at the end of each grading section for the cents of 1816-36 and 1837-57 reveal some of the peculiarities associated with specific varieties that may affect their grading. In actual practice, however, I've found that nearly all varieties of these years are likely to have been struck from dies exhibiting moderate to heavy wear. To identify just a few varieties as troublesome can be a bit misleading to the inexperienced collector. In addition, these varieties are identified in the grading guide by their Newcomb numbers, information not generally available to those collecting by type or date alone. I'll try to stick to generalities that apply to any and all cents of the 1816-39 period. As noted above, the majority of these dates and varieties were struck from dies revealing moderate to heavy wear. 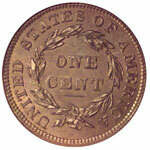 The Mint evidently used each die until it failed, and some of the resulting coins were very indistinct. Typically, the central elements of the design, such as Liberty's portrait and the wreath, were only slightly affected by die erosion; the problem presented by the worn dies was most severe on peripheral elements. The letters of the legends drew toward the edge as repeated impressions caused the die steel to gradually erode away from the centers. Unless a die prematurely failed from cracking, its normal lifespan saw the legends drawn outward until they touched the borders. The denticles around each border also deteriorated with repeated use of the dies, until they disappeared altogether. The fields of the die typically developed deep flow lines radiating outward from the center. 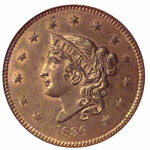 Ironically, mint-state coins struck from worn dies often exhibit the most satisfying luster. Fresh dies typically are prooflike and quite reflective, becoming more satiny when wear begins to appear in their fields. As wear progresses, the resulting flow lines give coins a swirling pattern of light reflection. So, large cents that may be somewhat deficient in technical quality often are most appealing to the eye. Since eye appeal is a major component in a coin's market value, grading services such as NGC may assign a high grade to a large cent that is less than fully detailed but excels in aesthetic quality. In descending order the priorities typically set by NGC's graders are eye appeal, surface quality, luster and sharpness of strike. The ideal in any coin is a combination of superior technical and aesthetic qualities but, with the exception of proofs, the two often are exclusive. All copper and bronze coins receive NGC's numerical grade followed by a color designation. Cents that retain at all nearly all of their red color are labeled "RD," while those showing lesser amounts are labeled "RB," shorthand for "red and brown." 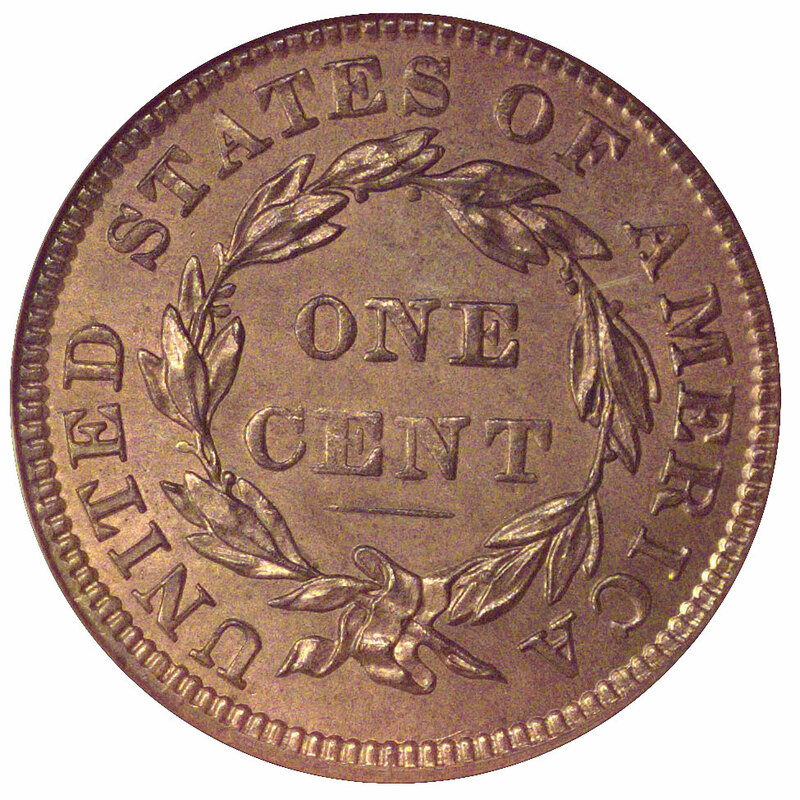 The designation "BN," for "brown," is applied to cents whose surfaces reveal little or no mint red or display primarily non-red coloration.